From antiques to second-hand clothes to sustainable food and handicrafts, there’s a lot to discover in Rio’s lively street markets this weekend. 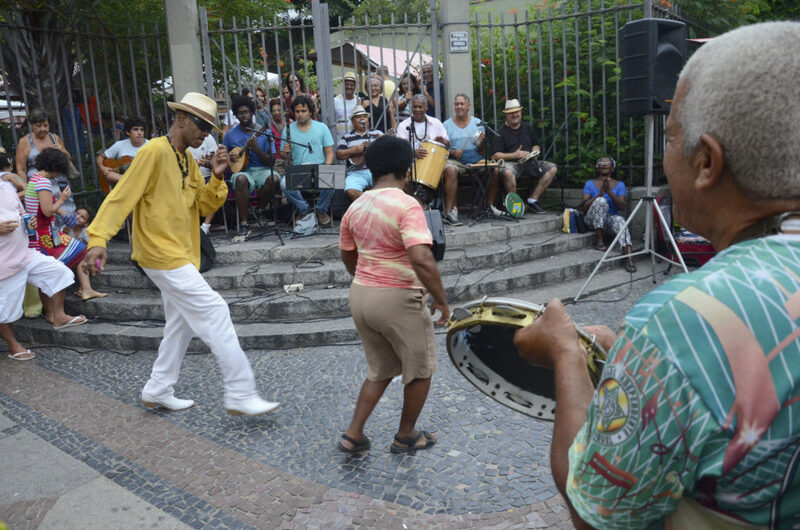 Expect plenty of ‘choro’ (a Brazilian genre similar to samba) music at this weekend’s markets, as Saturday marks the National Day of choro, photo courtesy of Alexandre Macieira/Riotur. Starting at around 10AM on Saturday, April 6th, Feira do Lavradio in Lapa is one of Rio’s best-loved street markets. And on the first Saturday of the month they host the ‘Rio Antigo Fair’ (Rio Antique Fair) with stalls selling furniture, clothes, crafts and much more. Plus, this Saturday is the official day of choro (a Brazilian musical genre similar to samba) so expect plenty of live music from local musicians such as the Pixin Bodega group, who will be playing in Praça Emilinha Borba at 4:30PM. Just down the road, Fundição Progresso is putting on the first ‘Mercado Fundição Sustentável’ (Fundição Sustainable Market), which will start at 11AM, coinciding with Lavradio and offering stalls showcasing sustainable produce such as cosmetics, aromatherapy, indigenous art, fashion and much more. Saturday is also the day for the ‘Circuito Interno’ (Internal Circuit) at Fábrica Bhering in Santo Cristo. This event, situated inside and around a restored antique chocolate factory, begins at 1PM and costs between R$5-R$10 entry. Once inside, guests can enjoy everything from artisan beer brewed onsite, a vegan cake shop, art exhibitions, bespoke fashion and even a sunset jazz session courtesy of the Pimenta Jazz Trio and taking place at 6PM on the spectacular outdoor terrace. On Sunday at 10AM the popular ‘Junta Local’ (Local Collective) returns to Botafogo’s Rua Capistrano de Abreu, with small businesses and producers showing off their excellent food and drink, plus participation from the Polo Botafogo group of restaurants. “We’re going to be doing Junta Local this Sunday next to Cobal. And I honestly think out of all the street markets Junta is the most committed to doing something good, has the best core values, and is fairest in terms of accessibility and price.” comments Dominic Parry, Junta Local stall-holder and co-owner of Winehouse Wine Bar and Cru Natural Wine Bar.